In this program, we climb Roman ruins in Nîmes, explore a papal palace in Avignon, and savor vivid views immortalized by Van Gogh in Arles. Crossing acres of lavender and wispy vineyards, we explore the Côtes du Rhône and more wonders of the south of France. This impressively preserved Roman aqueduct was built in about 19 B.C., and while most of it is on or below the ground, at Pont du Gard it spans a canyon on a massive bridge over the Gardon River — one of the most remarkable surviving Roman ruins anywhere. Pont du Gard is perhaps best enjoyed on your back and in the water — bring along a swimsuit and flip-flops for the rocks. The best Pont du Gard viewpoints are up steep hills with uneven footing — bring good shoes, too. Over the last millenium this stunning temple has been used as a church, a city hall, a private stable, an archive during the Revolution, a people's art gallery after the Revolution, and finally as the monument you can visit today. Admire its original columns and Corinthian capitals — it's a textbook example of a pseudoperipteral temple (surrounded by columns, half of which support the roof over a porch, and half of which merely decorate the rest of the building) and a "six-column temple" (a standard proportion — if it's six columns wide, it must be eleven columns deep). Nîmes' arena dates from about A.D. 100 and is more than 425 feet in diameter and 65 feet tall, with 24,000 seats that could be filled and emptied in minutes (through 60 passageways called vomitoires). Helpful English information panels combine with the excellent audioguide to give a thorough and enjoyable history lesson. Don't miss the panels describing the different types of gladiators, or the chance to climb to the very top of the stands — it's a rare opportunity to enjoy the view from a surviving high point — the nosebleed seats — of a Roman arena. Provençal "bullgames" are held in Arles and in neighboring towns. Those in Arles occupy the same seats that fans have used for nearly 2,000 years, and deliver the city's most memorable experience — the courses camarguaises in the ancient arena. The nonviolent "bullgames" are more sporting than bloody bullfights (though during Easter and the fall rice-harvest festival, the arena hosts traditional Spanish bullfights — look for "corrida" — with outfits, swords, spikes, and the whole gory shebang). Nearby villages stage courses camarguaises in small wooden bullrings nearly every weekend; tourist information offices have the latest schedule. At Le Caveau de Gigondas, Sandra and Barbara await your visit in a handsome tasting room with a large and free selection of tiny bottles for sampling, filled directly from the barrel. Here you can compare wines from 75 private producers in an intimate, low-key surrounding. The palace was built stark and strong, before the popes knew how long they'd be staying. This was the most fortified palace of the time — with 10-foot-thick walls, it was a symbol of power. The palace is pretty empty today — nothing portable survived both the pope's return to Rome and the French Revolution. But a big room near the entrance functions as a museum, with artifacts (such as cool 14th-century arrowheads) and a good intro video, and you can climb the tower for grand views. This bridge was a big deal even outside of its kiddie-tune fame. Built between 1171 and 1185, it was strategic — one of only three bridges crossing the mighty Rhône in the Middle Ages, important to pilgrims, merchants, and armies. It was damaged several times by floods and subsequently rebuilt. In 1668 most of it was knocked out for the last time by a disastrous icy flood. The townsfolk decided not to rebuild this time, and for more than a century, Avignon had no bridge across the Rhône. Your admission fee includes a small room that displays a 3-D reconstruction of the bridge and your only chance to walk a bit of the ramparts. Though there's not much to see on the bridge, the audioguide included with your ticket tells a good enough story. It's also fun to be in the breezy middle of the river with a sweeping city view. Romans grew wheat on the vast fields you can see from here, then brought it down to the mega-watermill of Barbegal, just outside what's now Fontvieille, near Arles. Historians figure that this mill produced enough flour each day to feed 12,000 hungry Romans. If you've seen the model of this eight-tiered mill in Arles' Ancient History Museum, the milling is easy to visualize — making a visit here quite an exciting experience. Nearly 2,000 years ago, gladiators fought wild animals here to the delight of 20,000 screaming fans — more than 30 rows of stone bleachers extended all the way to the top of the vacant arches that circle the arena. Now local daredevils still fight wild animals here, and "bullgame" posters around the arena advertise upcoming spectacles. If you visit, climb the medieval tower above the ticket booth to enjoy terrific city views. Hôtel le Calendal is a thoughtfully managed place ideally located between Arles' Roman Arena and Classical Theater. The hotel opens to the street with airy lounges and a lovely palm-shaded courtyard, providing an enjoyable refuge. They serve an elaborate buffet breakfast and offer lunch in the courtyard or at their café/sandwich bar. The rooms sport Provençal decor and come in random shapes and sizes. This is the leading museum in Provence for traditional culture and folklore. When it reopens after a long renovation (some time in 2019), it is expected to resume its place as one of the top attractions in Arles. This art foundation delivers a refreshing stop for modern-art lovers and Van Gogh fans, with two temporary exhibits per year in which contemporary artists pay homage to Vincent through thought-provoking interpretations of his works. You'll also see at least one original work by Van Gogh (painted during his time in the region). Hi, I'm Rick Steves, back with more of the best of Europe. This time we're in the south of France mixing Roman ruins, fine wine, a little Van Gogh, and even a French bullfight. Get ready for…not a year…but an exhilarating half hour in Provence. Deep in the south of France, Provence offers a rich palette of travel experiences: scenic, historic, and cultural. It's the ideal region to immerse yourself in the good life of France…and you may just come up a Francophile. We'll marvel at an ancient aqueduct, savor Côtes du Rhône wine in its birthplace, experience the quintessential Provençal market, play a little boules, follow in the footsteps of Van Gogh, and dodge bulls in a 2,000-year-old arena. France is nearly as big as Texas. The region of Provence stretches from the Mediterranean coast up the Rhône River Valley. We'll cross the Pont du Gard, sip our way through the Côtes du Rhône wine region, and explore the cities of Nîmes, Arles, Avignon, and Aix-en Provence. While its cities are packed with important sights, Provençal life feels rooted in its countryside, small towns, and vibrant markets. Its famous fields of lavender and sunflowers inspire painters. Its howling mistral wind can — as they say — blow the ears off a donkey. And its coveted Côtes du Rhône wines showcase this region's confident mastery of good living. And around here, good living is never far from nature. Where else can you canoe through such charming scenery and then under a nearly 2,000-year-old aqueduct? This region's evocative Roman ruins make history part of the picnic. The Pont du Gard reminds us that throughout the ancient world, aqueducts were stone flags heralding the greatness of Rome. And they still proclaim the wonders of that age. This perfectly preserved Roman bridge supported a canal, or "aqueduct," on the very top. It was a critical link, helping keep a steady river of water flowing cross-country to Nîmes — one of the Roman Empire's largest cities. Remarkably, the water dropped only one inch for every 350 feet. Let's go inside. This is what Roman aqueducts were all about. This is part of a 30-mile long channel — a man-made river flowed through this for 400 years. You can still see the original stones, a thin layer of mortar that waterproofed the channel, and, after centuries of use, a thick mineral build up. The Pont du Gard's main arch is the largest the Romans ever built — 80 feet across. The bridge itself has no mortar — just ingeniously stacked stones. Taking full advantage of the round arch the Romans invented, it's made strong by gravity. The Pont du Gard museum shows that a steady supply of water was an essential part of the Roman "art of living." You'll see some very old plumbing, walk through a rock quarry, and learn how they moved those huge blocks into place and constructed those massive arches. All this work was designed to bring water into the still-grand Roman city of Nîmes. The water finally gushed out here into this modest-looking distribution tank, from where it served the thirsty city's needs. Imagine the jubilation on that day in A.D. 50 when suddenly the system was operational. This is the very end of the aqueduct, and water would tumble out of this hole and fill this pool. Now, the system was designed to prioritize according to how much water was available. If the water level was high, these holes would send water to homes of the wealthy, to decorative fountains, to public baths. But if the water level was very low, these holes would still send water to the essential neighborhood wells. Today, the town's many Roman ruins testify to Nîmes' former importance. The Maison Carrée rivals Rome's Pantheon as the most complete building surviving from the Roman Empire. The temple survived in part because it's been in constant use for the last thousand years. The lettering across the front is long gone, but the remaining "nail holes" presented archeologists with a fun challenge: match the pattern of the nail holes to the letter it once held. And they solved the puzzle. They determined that the temple was built to honor Caius and Lucius, the grandsons of Emperor Augustus. And from that information, they dated the temple to the year 4 A.D.
Nîmes' arena — which is still in use — is considered the best preserved from ancient Rome. It's another fine example of Roman engineering…and Roman propaganda. In the spirit of "give the masses bread and circuses," admission was free. The emperor's agenda was to create a populace that was thoroughly Roman — enjoying the same activities and the same entertainment, all thinking as one. The arena still hosts colorful pageantry. And macho men still face dangerous beasts: bulls. A bullfight à la Provençale is more sporting than the bloody Spanish bullfights. A tiny ribbon, laced between the horns, sits on the bull's forehead. The daredevil fighters, gripping special hooks, try to snare the ribbon. The loudspeaker announces the reward various local businesses offer to the man who gets the ribbon. It's both advertising — "Pierre's Pâtisserie" offers €100 — and encouragement for the fighters. If the bull pulls a good stunt, the band congratulates him with a tune from the opera Carmen. Unlike more bloody bullfights, in Provence the bull — who, locals stress, "dies of old age" — always prances proudly out of the arena. Many travelers visit Nîmes only for its famous Roman sights and are pleasantly surprised by the rest of the town. Inviting pedestrian streets and café-filled squares give it a relaxing charm. A foundation of Nîmes' affluence was denim — a fabric that seems as American as apple pie. But the word denim actually means "from Nîmes"…de Nîmes. In the early 1700s, Nîmes had a thriving textile industry. And it needed a reliable source of water to power its mills and help dye its famous fabric. To support its denim producers, the city built an extensive system of industrial canals, which was ornamented with a lavish Versailles-type park. This happened just 50 years after the construction of the king's palace at Versailles, and, to the French, this people's place has a special significance. These were the first grand gardens designed not for royalty, but for the public. Nîmes is an hour's drive from the sunny Côtes du Rhône region. 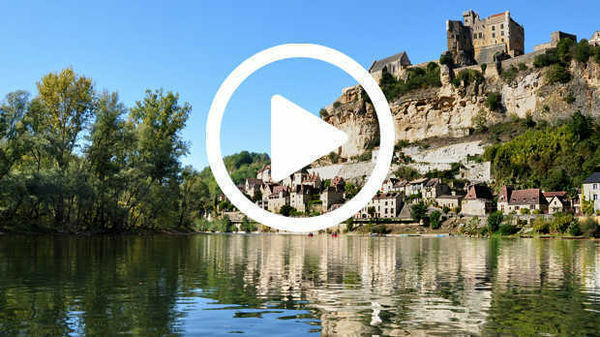 Here you'll follow one of France's favorite wine roads, weaving through a rustic landscape carpeted with vines and peppered with warm stone villages. The lovingly tended vines of the Côtes du Rhône — grown on the côtes, or hillsides, of the Rhône River Valley — make wines that are delightful on your palate, yet easy on your pocketbook. Traveling in May, we see the selection of just the best spring shoots on these gnarly old vines. This region was first planted with grapes by the Greeks, around 600 B.C. Romans built upon what the Greeks started, realizing even back then that here in Provence the stony soil, mild winters, and long, hot summers were ideal for producing great wine. Most villages have winemaking co-ops, offering a handy one-stop place to taste the various wines. My friend and fellow tour guide Sabine Leteinturier is joining us to be sure I get the fine points of Provençal culture just right. Sabine: Wait until you taste those wines. This is the Caveau de Gigondas. It's a cooperative. Within the Côtes du Rhône, villages like Gigondas have family-run wineries. Visitors are presented with a list, and from that they can sample from an enticing selection. The tiny sampling bottles are filled directly from the barrel. Because you're buying direct from the grower, prices are excellent. Vintners are happy to work with you — if they can figure out what you want. Knowing what you like — drier, full-bodied, more fruity, less tannic, and so on — is helpful. And knowing the term in French is even more helpful. Sabine: For French wine really you do not have an indication of the grape, but what you will have on the label is where the wine is coming from. Which will give you the snapshot of the terroir. Rick: What is the terroir? Sabine: Terroir describes the physical condition, the climatic condition of where the vineyard is. So, in that you have a reference on the soil, the slope, how much sun it gets. Rick: So if you know the terroir, you know the personality of the wine. Rick: So, you come into a place like this and you've got like, 50 different selections, how on earth do you know which wine you want? Sabine: Well, the first thing you have to decide: What's for dinner? Are you going to have, shall we have grilled meat, are we going to have game, a strong, you know, a strong meat with a sauce? And then we select the wine. Rick: So, you go to a friend's house and they're serving some game with a spicy sauce and they come up with just an off-the-wall wine…you are aware of that? Rick: They conceived it, like creating the instrumentation for a different composition, a musical composition. Sabine: That's right, you really get really that subtlety. Rick: I was thinking oboes and you've got French horns! The French eat long and well, especially here in the south. Relaxed tree-shaded lunches, long dinners, and lazy afternoons at outdoor cafés are the norm. The French have a legislated 35-hour workweek…and, it seems, a self-imposed 30-hour eat-week. Provence has been called France's "garden market." Salads are popular. Provençal cuisine loves garlic, olive oil, and herbs. Order anything à la Provençale, and you'll be well rewarded. Laid-back lunches often come with a chilled rosé — the blush wines are considered refreshing. They can be very good and are respected along with whites and reds. Aix-en-Provence is the historic capital of the region. For a tourist, Aix is delightfully free of must-see museums or ancient ruins. It's simply a wealthy town — its people known for living well and looking good. Aix's university gives the city a youthful energy. Centuries ago, the king made Aix the district's administrative center. Noble French families moved in, kicking off the city's beautiful age, or "belle époque." They lined the streets with private mansions giving Aix its classy appearance. Aix thrived thanks to its aristocratic population. But when the Revolution came — and the bust of the king on the city hall was replaced by Marianne, the Lady of the Republic — suddenly it became dangerous to be an aristocrat. The wealthy fled the city, and Aix slumbered through most of the 1800s. But today, once again, it's resumed its trendy ways. The main boulevard, Cours Mirabeau, is designed for the rich and famous to strut their fancy stuff. It survives much as it was: narrow for traffic, and very wide for pedestrians who would promenade under their elegant mansions. Cours Mirabeau remains the place for tendance — that's trendiness. The French are world-class people watchers. Enjoy the show. In Aix's old town, inviting pedestrian streets hum with activity. Towns are particularly lively on market days. Good guidebooks list market days and travelers who plan well enjoy the most vivid experience. Aix's farmer's market is a classic Provençal scene — rustic farmers selling fresh produce under the shade of graceful plane trees. Sabine: Freshness is everything in the Provençal cooking. Here's your garlic, essential to Provençal cuisine. Can't cook without it. Sabine: And you have your herbs of Provence, you have your dried sage, thyme, rosemary. We're all set for cooking. Sabine: This is goat cheese. In Provence we have goat cheese, not cow's cheese. Rick: Huh! And it's not so strong. Sabine: It is very good…delicious. It goes from mild to stronger in taste with age. And just beyond any market you're likely to find the local gang playing boules. Boules is the horseshoes of southern France. It's played in every village on gravelly courts kept just for this purpose. Every French boy grows up playing boules. It's entertaining to watch — especially if you understand the rules. Boules is played with heavy metal balls (or boules) and a tiny target ball. Whoever gets their boule closest to the target ball, scores. There are two on a team — one lobs the ball as close to the target as he can. The other tries to knock away the opponent's boules. Once all the balls have been launched and the attempted blasting is over, measurements are made. Whoever ends up with the ball closest to the target receives one point. The first to reach thirteen wins. Between rounds, players are happy to let curious travelers give it a try. Rick: OK here we go, ready, here we go. Like so? Boules player: Comme ça. Oui! The nearby city of Avignon is famous for its papal palace and its broken bridge. Contemporary Avignon prospers behind its mighty medieval walls. With its large student population and fashionable shops, Avignon is an intriguing blend of youthful spirit and sophistication. Its foreboding papal palace dominates the old town. Through most of the 14th century the Catholic Church was run from here in Avignon. In 1309, the French-born pope Clement V decided to move the papacy from Rome to Avignon. All of Europe recognized Clement as the legitimate pope. During that period Avignon grew from a quiet village to a powerful city. The Church basically bought up the town and made it Europe's largest construction zone. It built its wall, mansions for cardinals, residences for the entire Vatican bureaucracy, vast public squares, and the pope's towering palace. After about 70 years, a later pope moved the papacy back to Rome. But Avignon installed its own rival pope, and for about 40 years there were two disputed popes — one in Rome and one in Avignon. Finally, in 1417, a Church-wide council affirmed the Roman pope, Avignon dropped its claim, and what was called the "Great Schism" was over. This bridge is the Pont d'Avignon, made famous by the 15th-century folk song known to all French school kids. Avignon's famous bridge was vital for trade in the Middle Ages. While only a few arches survive, the bridge was huge — extending all the way to the lonely Tower of Philip the Fair, which marked the beginning of France. Like Nîmes, industrial Avignon was thoroughly water-powered. Its river was split into canals to drive waterwheels, which powered the town's 19th-century factories and textile mills. This "Street of the Dyers" is charming; its limestone car barriers are carved whimsically by amateur sculptors. Avignon retains its quaint Industrial Age souvenirs. But its sleek new train station, which welcomes France's bullet train, is a good example of how France is embracing modern technology and investing in public transportation. The 180-mph TGV trains now put the south of France less than three hours from Paris. And the freeways are doing their best to keep up the pace. In France, like almost anywhere in Europe, the fastest way from A to B is the autoroute — or freeway. French autoroutes come with tolls. But if you're in a hurry, they easily save enough time to justify the expense. But of course, slow roads come with more memories. To be all alone with your own personal Roman ruin, take a quick detour to the Aqueduct of Barbegal. These are the scant remains of an ancient Roman power station…channeling a river to turn their mills. The Romans ingeniously harnessed maximum power from the water flow. They built a series of terraced pools, allowing the water to cascade down, powering eight separate grinding mills. Romans grew wheat on these vast fields, and brought the grain here to the mega watermill. Cutting through this bluff, the water from this aqueduct provided power to produce enough flour each day to feed 12,000 hungry Romans. The mill served the nearby Roman town of Arles…and that's where we're heading. By helping Julius Caesar defeat Marseille, the people of Arles earned the imperial nod, and their city was made an important river port. With its strategic bridge over the Rhône River, Arles was a key stop on the Roman road from Italy to Spain. After being a trading center for centuries, Arles became a sleepy town of little importance in the 1700s. Allied bombs destroyed much of the city in World War II. But today, Arles thrives again. This compact city is alive with Roman ruins, an eclectic assortment of museums, and welcoming pedestrian zones. It's my favorite home base from which to explore France's Provence region. Twice a week, Arles' ring road erupts into an open-air market of flowers, ready-for-ratatouille baskets of produce, and everything but car traffic. Join in, try the olives…sniff that lavender of Provence. The beauty of this market is its international flavor, reflecting how Provence remains a crossroads of Mediterranean cultures: paella from Spain, fragrant mint leaves for tea, spices from North Africa. The market feels a little like a bazaar thanks to the many Algerians and Moroccans who call Arles home. Throughout France, but especially here in the south, Muslim North Africans — from France's former colonies — have come to pick olives, harvest fruit, and so on. While they are integrating, France is dealing with the friction any country has when immigrant laborers do its lowliest jobs. The Forum Square is named for the Roman forum that once stood right here. This square was the political and religious center of Roman Arles. Still lively, it's just the place for a pastis. This is the traditional aperitif here in Provence. It's a mix or blend of anise and other herbs and you cut it, dilute it, according to taste. They serve it with a carafe of water. It's almost a tradition here before a meal to get together with good friends and enjoy a pastis. The most dramatic remnant of Roman Arles is its arena. Imagine the roar of the fans packing this place nearly 2,000 years ago as gladiators battled wild animals. The floor was covered with sand to absorb all the blood. The word "arena" actually means "sand." While the grand city of Rome could afford exotic beasts like tigers and lions from faraway places, smaller towns like Arles made do with snarly local beasts like wild boar, bears, and so on. Like in Nîmes, the arena in Arles is still used for concerts, bullfights, and other spectacles. In tumultuous medieval times, locals bricked up the arches, turning the stadium into a fortified town — over a hundred humble homes were crammed within its circular defenses. Three of its medieval towers survive. We're staying at Hôtel Calendal. The friendly staff speaks English — not unusual here in Provence. Its rooms are quiet and comfy — and many come with views. Guests enjoy Internet access, an enticing breakfast buffet, and the shady, Provençal-chic courtyard. The Calendal provides just the mix of comfort and economy I look for when researching my guidebooks. Nearby, the Arlaten Museum was founded to give locals an appreciation of their cultural roots. That starts with ancient Rome — the building itself seems to embrace an evocative old temple. Visitors enjoy an intimate look at Provençal folk culture, and that includes traditional dress from the 18th and 19th centuries. Freestanding wedding armoires were given to brides by parents and filled with the essentials to begin a new life. Carved wooden cages — called panetière — hung from the walls, keeping bread away from hungry critters. Provençal traditions are remembered: Here a wealthy woman just had a baby and is visited by friends bringing gifts representing physical and moral qualities — they hope the baby will be full as an egg, wise as salt, and straight as a match. Perhaps Arles' most famous resident was a Dutchman — Vincent van Gogh. He was 35 when he moved here in 1888, and it was here that he discovered the light that inspired in him an explosion of creativity. Van Gogh, coming from the gray skies and flatlands of Holland and Paris was inspired by everything Provençal — he claimed, "the whole future of art is to be found here in the south of France." Here in Arles, nearly everywhere you turn, you see scenes that could have inspired Van Gogh. While here he worked in a flurry, producing more paintings than at any other period in his too-brief career — nearly 200 canvases in just over a year. You can still visit the places that inspired him, like this hospital courtyard. While all Van Gogh left in Arles was a chunk of his ear — you won't find any paintings — his legacy continues at the Foundation Van Gogh. It features a stimulating collection of works by contemporary artists paying homage to Van Gogh through their thought-provoking interpretations of Vincent's work. Whether you're in search of the magic light like Van Gogh, perhaps the best Roman ruins anywhere, a bloodless bullfight, lessons in boules, or just the right wine…Provence has it all. Vive la Provence! I hope you've enjoyed our look at this small, but endearing slice of France. I'm Rick Steves. Until next time, keep on traveling. Au revoir! He discovered the light which inspired him an explooosion of creativity. The town thrives and it's a threndy place to be. Threndy? Threndy?